Conspiracy theories can be undeniably appealing and addictive to read. One of the reasons for this is that they are so hard to disprove. In fact, for the true conspiracy theory devotee, evidence that seemingly disproves the theory is turned around and used as part of the conspiracy. An internal CIA document confirming that Lee Harvey Oswald acted alone for instance, is then understood as evidence of how far up the conspiracy goes. That logic (or lack thereof) ensures that the conspiracy will live on for future sleuths. At their best, conspiracy theories are harmless entertainment, but at their worst, they cause real damage. I would contend that the flat-earthers qualify as the former, with Pizzagate most definitely as the latter. And somewhere in the middle of those lies Tom Thomson, famed Canadian artist and member of the Group of Seven. 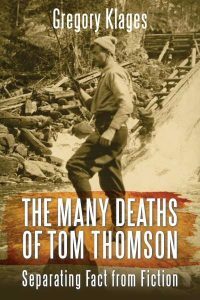 Given my interest in conspiracies and wild theories, I was excited to read Gregory Klages’ new book The Many Deaths of Tom Thomson: Separating Fact from Fiction. Like many artists before him, Thomson was not a particularly well known figure during his life. In addition to painting, he held a series of jobs just to sustain himself. When his art did sell, it generally wasn’t for large sums of money and Thomson toiled in virtual anonymity producing pieces that would later become some of the most celebrated art ever produced by a Canadian. There is a certain cruelty to the fact that it wasn’t until after he died that Thomson became a celebrated artist. Perhaps it’s confirmation bias, but that seems to be a somewhat regular thing in the art world – in fact, second to having no talent, it’s the main reason why I didn’t pursue art. The part that’s troubling isn’t the anonymity during life, but the economics that goes along with it. Struggling to survive on your art while you’re alive seems unfair when it is sold for hundreds of thousands of dollars when you’re dead. But what happens if the manner in which you died contributed to the value of your art? To a certain extent, this is what happened with Tom Thomson. Following his death on Canoe Lake in Ontario in July 1917, people started to question the official version that his death was a tragic accident. From suicide, to murder, to a vicious bar fight, a variety of scenarios have been presented over the past 100 years claiming to present the truth of how Thomson met his untimely demise. In The Many Deaths of Tom Thomson, Klages breaks through the hyperbole in order to outline the historical evidence we have from that fateful day. Broken into three sections, the book outlines Thomson’s life, the evidence surrounding his death, and the various theories on how he died. It is this final section that has generated a good deal of public interest in the book, but overlooking the first two sections would be a big mistake. Given the intense interest in his death, understanding his life is a major component to the story. And what’s particularly good about the section is that not only does it introduce material relevant to his death, it also provides background to his art that allows the reader to reconsider Thomson as an artist. The subtlety with which this is achieved is remarkable: you think you’re getting a book on the various theories and innuendo about his death, and while you are, you also get a terrific primer on his career. From there, Klages meticulously but efficiently outlines the available evidence surrounding that July day. Historians will appreciate the research work done in this section while non-historians will enjoy how Klages presents the evidence of prepares you for the final section. And in that final section, each chapter presents a different theory about Thomson’s death. While it would be easy to have a mocking tone in this section, particularly with regards to some of the more scandalous claims, Klages resists this and presents the material in an earnest and upfront manner. By putting the theories against the evidence, Klages allows the reader to consider all options, a welcome departure from the genre’s typical narrative style. As a result, The Many Deaths of Tom Thomson hits all the right notes. It’s well researched and illuminates a major Canadian cultural figure while at the same time making room for conspiracies and potentially outlandish claims. At a time when facts have given way to feelings, it’s a terrific reminder of the historian’s responsibility to ensure the evidence is always at the forefront. In this episode of the History Slam I talk with Gregory Klages about the book. We talk about Tom Thomson’s life, the various conspiracies, and the research method for exploring such divergent theories.